all without corn syrup or hydrogenated fats! ​Cinnamon buns are 100% whole grain! We now have an online store! We only have a couple of items that you can buy there. 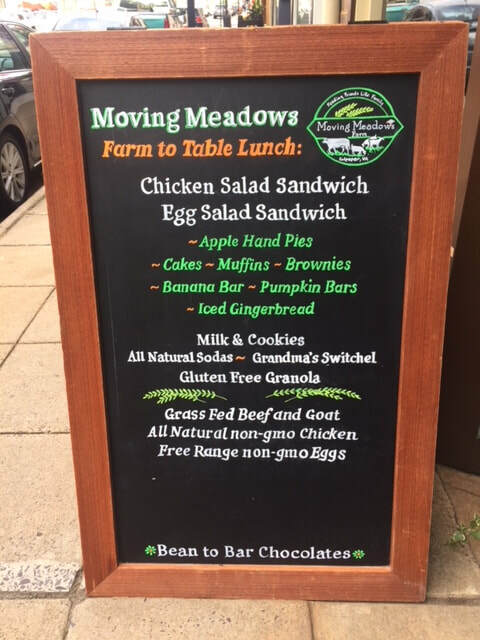 We sell all natural meats (grass fed beef & goat, pastured chicken & turkeys) raised with care on our farm here in Culpeper. good for the animals and the land; ​good for us! take out or eat in, come join us! Our on street tables make a pleasant outdoor eating experience, weather permitting. 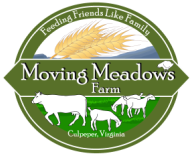 FRIDAY IS CHILI & CORNBREAD DAY at Moving Meadows Farm & Bakery! ​freshly ground non-gmo corn milled by us! 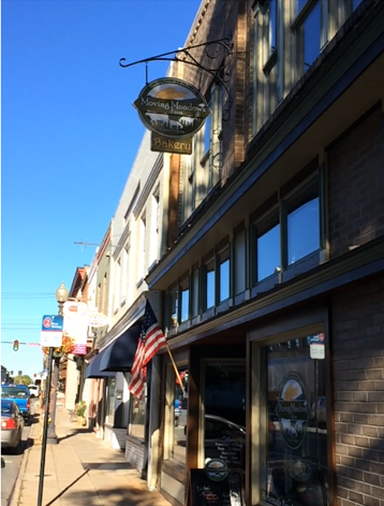 Come early... the cornbread will still be warm! All soups made with organic veggies when available. All are non-GMO and healthy! "Best soup I've ever had," says one happy customer! also available made with our own farm fresh eggs and all natural mayo. ​ all natural Rootbeer, blueberry or sarsaparilla sodas, ginger brew, or other natural drinks found in our case. Also available: 3 varieties of gluten-free granola made with organic maple syrup, organic coconut oil, unsweetened, unsulfured coconut, organic olive oil... it's crunchy and just plain DELICIOUS! ​purchase some to take home for your own baked goods. Pastured Raised Chicken - We also raise chickens using natural farming techniques and feed. We specifically avoid using genetically modified feed (GMO) that is so common because there is significant evidence that it is harmful to both animals and humans. The chickens are raised in mobile coops encircled with electrified netting for predator protection. They get lots of greens and bugs in their diet and are moved to fresh pasture daily. Grassfed Beef - Cows are given fresh pasture daily, and in fact, are moved twice daily to a fresh paddock using a management technique known as mob grazing. They are never given any hormones, antibiotics, wormers or other chemicals. We do not feed them grain to finish them--we finish on grass alone. This is the most healthy beef you can eat with the right balance of omega-3 and omega-6 and lots of CLA. Gourmet Goat - Raised with daily fresh pasture moves similar to the cows, these goats live a good life. The absolutely love to forage in our tree lines, eating anything with a thorn on it. The meat is delicious, tasting much like beef.